Your Guide to the Best Costa Rica Birding Lodges! Avid birders have some thrilling packages to choose from! We offer tours from coast to coast and everything in-between. But one of the best things about these tours is that you don’t only spot birds during your tour, but also from your lodge! This guide is for all the naturists, adventurists, explorers, birders and wildlife lovers! With over 900 species recorded, Costa Rica is the perfect location for birders. Costa Rica Birding Lodges offer birders unimaginable birding opportunities all over the country because of the many unique species of birds that inhabit Costa Rica. This guide lists our suggestions of the top 10 birding lodges and hotels in Costa Rica that gives you the best birding experience possible! Tours and packages offered at the Costa Rica Birding Lodges offer you the chance to spot unique, tropical birds like the scarlet macaws, the keel-billed toucan, and the rare black-bellied whistling duck and the famous Resplendent Quetzal. Our 10 best birding lodges are examples of quality birding locations all over the country. Have a look! Sarapique might sound familiar as a top white-water rafting destination, but it is also renowned for its biodiversity. This town and river area is located in the Heredia Province and is close to Puerto Viejo. Sarapique is an ecotourist’s dream and should be high on the list of any birder. The nearby Braulio Carrillo National Park boasts 500 bird species as well as 6000 kinds of plants in 5 eco-zones. La Selva is a world-famous bio station that focuses on ecotourism, education conservation and research. Rancho Naturalista can brag about its reputation as one of the best Birding Lodges in the whole of Central America. Hummingbirds as well as many others can be seen from the balcony alone! Feeders placed along the balcony have been known to attract bird like the White-necked Jacobin, the Violet Sabrewing, the violet-crowned Woodnymph, the Bronze-tailed Plumeleteer, the Green Hermit, Green Thorntail and Green-crowned Brilliant. You can also take full-day birding tours. The birds will be most active in the morning and in the afternoon, you can take a short walk in the private forest and head to the humming bird pools! The Arenal Volcano is known for many things. The La Fortuna Waterfall, the hanging bridges, canopy tours and rafting trips, … But did you know it also has a stunning lodge with unique birding opportunities? The Arenal Observatory Lodge & Spa is first and foremost an observation center to register the volcanic activity of the still active Arenal Volcano. 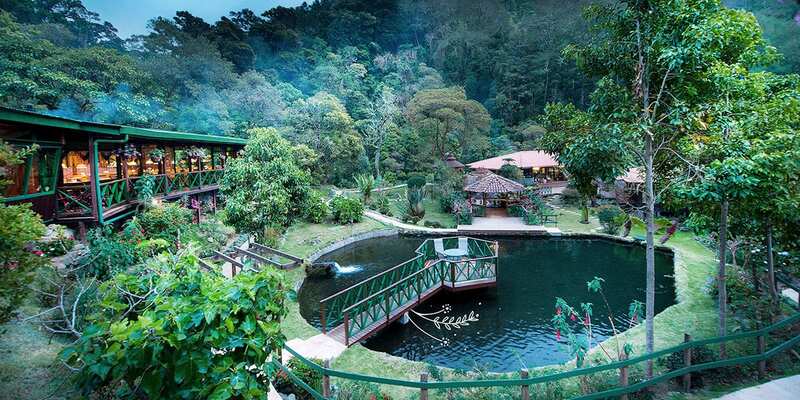 But in addition to that, over 500 species have been recorded in the forests surrounding this lodge. Some examples of the birds spotted here are the black-crested coquette, the lovely cotinga, the bare-necked umbrellabird, the yellow-eared toucanet, the great curassow, the emerald tanager, the thicket antpitta, the ornate hawk-eagle and the tiger-heron. The Monteverde Cloud Forest is a real gem high on the list for most Costa Rica travelers. Birders from all over the world flock to this cloud forest in hopes of spotting the famous resplendent quetzal, the Mot Not, the Three Wattle Bell Bird, or some of the other 400 known bird species that live in Monteverde or periodically pay a visit. In addition, Monteverde has 2000 species of plants and 100 species of mammals. The Osa Penisula is known as the place with the highest level of biodiversity in the world. Next to housing over 400 species of birds, the South Pacific also an incredible number of other animals including all four monkey species and all six felines as well as humpback whales. The surrounding area is stunning and a little more rough around the edges compared to the rest of the country, especially the famous Corcovado National park. Located on Costa Rica’s Caribbean Coast, Tortuguero is a stunning and unique national park that has a network of canals and rivers running through the lush jungles. You can spot turtles (hence the name), caimans, crocodiles, and also birds. Rather than walking, you will be taking a relaxing boat ride and keep your binoculars and camera at the ready. It is a great place to spot birds like the hummingbirds, green Ibis, Osprey, Chapulinero Hawk, crab-eating, red parrot, green Parrot, Pájara Estaca, kingfishers, Warblers, trogons, woodpeckers, the roseate spoonbill, herons, Orioles, Buco Pinto, Oropendolas, the purple chicken and three species of toucans. Jaco is more than a party and surfer beach. It is also a great place for bird watching! Jaco is close to Carara National Park and the Tarcoles River. You will find famous species like the Scarlet macaws, Mot Mots, the trogon, toucans, and a variety of water birds like herons. Since Carara is the transition zone between Tropical Rainforest and Tropical Dry forest, you will get a chance to see the bird species that inhabit both of these regions. Perhaps even the Great Green Macaw! Rincon de la Vieja is one of the glorious giants towering over Liberia in the province of Guanacaste. You can enjoy several adventure packages and explore the unique flora and fauna in this area. The Hacienda Guachipelin is famous for having some of the best touring packages in the area. Explore the phenomenon of the tropical dry forest and spot the spectacled owl, the Curassow, the Montezuma Oropendola and many more! Additionally, you can also spot many monkeys such as howler monkeys. San Gerardo de Dota is located at the borrom of the Talamanca Mountain Range in the Southern Costa Rica. With an altitude of 2200 meters, San Gerardo de Dota has fresh and clean air and us surrounded by lush green rainforest with incredible biodiversity. Los Quetzales National Park is home to three different kinds of rainforests and 14 ecosystems! It is the ideal place for a birding vacation in Costa Rica. You’ll see the Resplendent Quetzal, of course, in addition to woodpeckers, trogons, macaws and different species of hummingbirds. The biodiverse area is also home to sloths, felines and some of the most astonishing flora and fauna in Costa Rica. Yes, we thought the beautiful Osa Peninsula deserved another spot on this list. Playa Cativo is a luxury beachfront lodge located at Golfo Dulce. You will get the real sensation of immersing yourself into nature as well as enjoying one of Costa Rica’s most beautiful beaches. Playa Cativo is located within close proximity of Piedras Blancas National Park and Cativo’s Private Nature Reserve as well as Corcovado National Park. Let us help you plan the perfect birding vacation in Costa Rica!